We didn't even have to think of a clever title for our review. The supernally creative team at Heartbeat Opera did it for us. 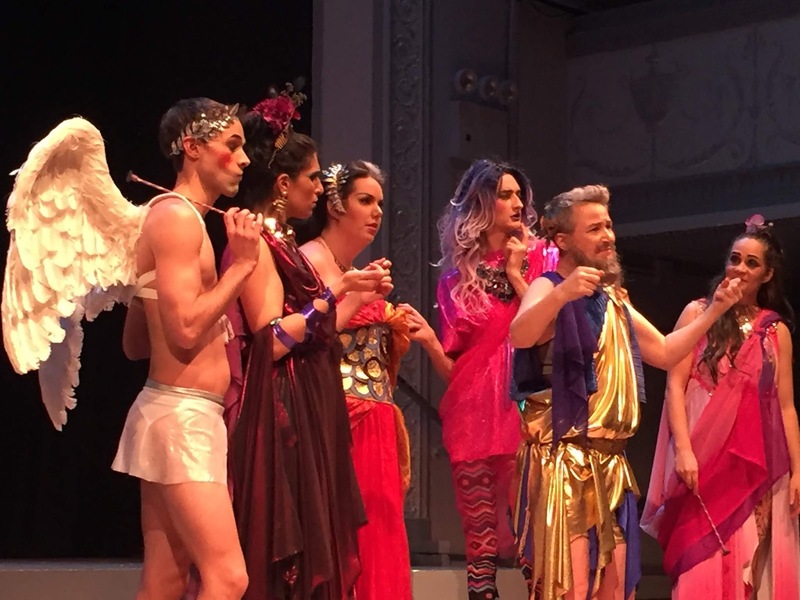 Conceived by Co-Artistic Directors Louisa Proske and Ethan Heard, and directed by Mr. Heard, the 2018 version of Heartbeat Opera's annual Halloween drag extravaganza left us grinning from ear to ear. What an overdose of imagination we witnessed, surpassing even last year's Mozart in Space. The overall concept was that of the blind poet Homer, wearing golden winged shoes provided by Mercury,visiting various mythological creatures in ancient Greece. He encounters one phantasmagoric creature after another, many of whom offered arias of the Baroque period, when operas were written based on mythology. The entire evening was dazzling and we scarcely know what to write about first. Since our focus is on opera, let us begin with Nicolette Mavroleon in drag as Nerone singing "Come nube che fugge dal vento" from Handel's Agrippina, fiddling on a golden violin whilst Rome burned virtually through projections by Shawn Boyle. Nero renounces love in favor of political power. We confess to being distracted by her golden costume but not too much to miss appreciation of a fine vocal performance. Similarly, Jamilyn Manning-White's elaborate black and silver costume, complete with snakes coming out of her head almost distracted us from the world premiere of "Feed the Snakes", composed by Co-Music Director Daniel Schlosberg with lyrics by Royce Vavrek. Ms. Manning-White is a riveting performer with equal dramatic and vocal skills. These two fine artists reappeared as Sappho and her Muse singing "Pur ti miro, Pur ti godo" from Monteverdi's L'incoronazione di Poppea, the gorgeous final duet between Poppea and Nerone. Sara Couden impressed as Dejanira singing "Where Shall I Fly?" from Handel's rarely produced Hercules. Dejanira has gone mad after causing the death of her husband Hercules. She gets many changes of mood, color, and tempi. The always marvelous John Taylor Ward appeared as the scary-looking cyclops Polyphemus, singing "Fra l'ombre e gl'orrori" from Handel's Aci, Galatea, e Polifemo. Who but Mr. Ward has the vocal range and agility to pull off this buffa aria! In a totally different role, Mr. Ward created a very tall and very skinny leather-bound fly, a manifestation of Jupiter, buzzing around the lovely Eurydice (lovely Ms. Manning-White) who attacked him with an electrified fly swatter, in the duet from Offenbach's Orpheus in the Underworld. There was also a performance of the famous "Can-Can" with a Minotaur doing a split at the end. Drae Campbell was just right as Homer, feeling his way around with a blind man's cane. Justin Mock appeared as the winged Cupid, as Cerberus (the three-headed dog) and as the Minotaur. Aphrodite was performed by Pearl Harbor, whose real name is Wo Chan. This role was lip-synced and the beautiful voice we heard was that of Peregrine Teng Heard who also wrote the show with Mr. Heard. Co-Musical Directors Jacob Ashworth and Daniel Schlosberg provided the music with Mr. Schlosberg's arrangements for violin (Mr. Ashworth and Mélanie Clapiès), cello (Clare Monfredo), bass (Dara Bloom) and clarinet (Gleb Kanasevich). Mr. Schlosberg conducted from the harpsichord. The fantastic costumes, hair, and makeup were designed by Fabian Aguilar, Jon Carter, Miodrag Guberinic, and Andrew Jordan. Their contributions were essential to putting the concept across. Choreographer was Heartbeat regular Emma Crane Jaster. Lighting was by Krista Smith. Props were designed by Corinne Gologursky. All of these wildly talented people contributed to an evening that made our heart beat faster. We could not imagine a better celebration of the arts and gender diversity/fluidity!